Voodoo Tactical 36" Padded Weapons Case FREE SHIPPING! Owning a precision firearm only to have it damaged in transport can be devastating. 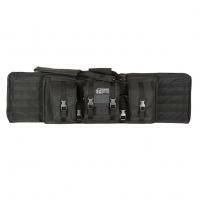 Carry firearms, attachments, ammo and more gear comfortably and securely with the Voodoo Tactical 36" Padded Weapons Case. Designed to be an all-in-one versatile weapon carrier, the transport case features a durable construction, superior protection and an abundance of storage options. Built to hold any firearm up to 35 inches in length, the rifle case is ideal for M4 carbines and other long barrel rifles. Six sides of thick, heavy-duty foam padding offer ample protection for not only the rifle, but also attached optics, muzzles and accessories. Two sets of adjustable tie-downs offer custom securement able to fit the exact dimensions of each rifle. Two additional padded pouches offer secure storage of small accessories or firearms, such as pistols, optics, radios or sensitive equipment. Three large exterior pockets provide further storage for ammunition boxes, extra magazines, additional targets and other shooting equipment. External MOLLE-webbing allows for greater attachment options. Carry Voodoo's Weapons Case with ease using one of three carrying options: a reinforced handle for convenient free-hand carry, the removable shoulder strap for medium distances or use the backpack harness for long distance transport. This case is great. It holds everything I need for a day at the range. Rifle, nine magazines, papersilhouette targets, eye pro, ear pro and my cleaning kit. I can also keep me and my wife's pistols in the smaller compartment. I strongly recommend this case. One nice bag. A bit heavy with an ar and 590 but packs nicely behind the seat in my truck. Quick delivery was great. ©2002-2019 CopsPlus.com: Voodoo Tactical 36" Padded Weapons Case FREE SHIPPING!